Objective: Spontaneous cervical artery dissection (CAD) is a cerebrovascular disease typically considered to affect the young population. Literature reports cases in the elderly only as incidental findings, making the diagnosis unlikely in older patients. Incidence and pathogeny in this specific population remain to be assessed. Methods: We reviewed patients aged over 70 years admitted for spontaneous CAD in the Stroke Unit of the University Hospital of Nancy (northeastern France) over a period of 12 years as well as all reported cases in literature. Results: During this period, only two patients aged over 70 years were diagnosed with internal carotid artery dissection in our center. The first patient was diagnosed with the typical radiological feature of long tapered stenosis due to mural hematoma. The second patient presented with the classic painful Horner syndrome. Literature review identified only two case reports and eight studies with an age range above 70 years. Headache was present in nearly all documented cases. Radiological features were the same as those usually described in younger patients. Conclusions: Even if spontaneous CAD in patients aged over 70 years would appear to be rare, it does occur with comparable clinical and radiological features as in the younger population. CAD is probably underdiagnosed in this population due to a higher prevalence of more common causes of stroke at this age. 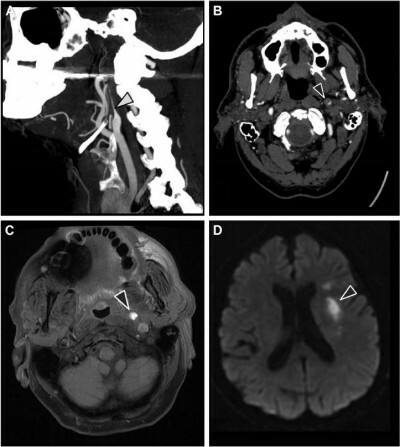 However, a simple investigation into headache or the Horner syndrome during the patient’s diagnostic workup would lead to adapted exploration of cervical arteries and improve detection of CAD in the elderly.